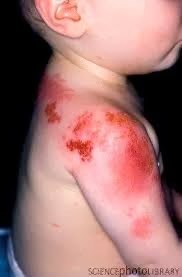 Shingles in children is a rare condition. Less than 5 percent of all shingles sufferers are children. 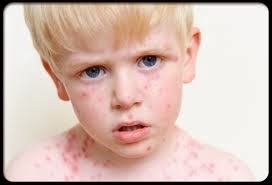 The disease, which is characterized by a rash, occurs as the second stage of chicken pox. After a child or adult contracts chicken pox, the varicella zoster virus can remain dormant in their body's nerve cells. Often, it will remain dormant for the rest of their lives, but in 1 percent of all people who contract chicken pox, the condition will return as shingles. Although shingles can appear at any age, it typically shows up in patients over 20, with the majority of sufferers being middle-aged or older. Shingles is caused by the Varicella zoster virus, which is the same virus that causes chickenpox. Shingles occurs in children and adults who’ve previously had chickenpox. After an episode of chickenpox, the Varicella zoster virus ‘sleeps’ in the nerve cells and can be triggered by unknown causes. In adults, shingles will begin with flu-like symptoms, including muscle aches, fever and chills. The virus will then cause severe pain in the nerves, a burning sensation and blistering of the skin on the torso. In children, there is no pain or fever associated with the condition. The disease may take up to five weeks to run its course. Once shingles reaches the blistering stage, it can be contagious by direct contact to people who have not had chicken pox. 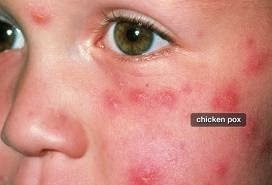 Children should be kept away from individuals who have not had chicken pox or the chicken pox vaccine at this stage to prevent spreading the varicella zoster virus. However, if it is spread, the infected patient will develop chicken pox rather than shingles. Unlike chicken pox, which may be spread through airborne droplets, varicella zoster in shingles can only be spread through direct contact. Exposure to chickenpox while in utero is a leading cause of childhood shingles. Infants whose mothers develop chickenpox up to 21 days prior to giving birth are likely to inherit the infection. These poor newborns often face life-threatening diseases due to this infection as their brand new immune systems are not ready to battle chickenpox. Though there are aggressive intravenous treatments, most of these children go on to develop shingles later in childhood. Although shingles is contagious, it can only be transmitted to others if they come into direct contact with the rash. Because of that, your child can still go to school after the rash has developed crusts if the rashes are located on parts of his body that can stay completely covered up and if he doesn't have a fever or suffer from headaches and fatigue. You should, however, still check with your child's school. Left on its own, the crusty rash that develops with shingles heals and goes away within seven to 10 days without any specific treatment. Pain medication such as acetaminophen may be used to help ease your child's pain. Cold compresses, oatmeal baths and calamine lotion may also help to decrease the itching associated with the rash. Your doctor might prescribe an antiviral drug, such as aciclovir, if your child is seen within 72 hours of the rash starting. A shingles vaccine is available to help prevent shingles. Zostavax can be given as a one time dose to adults 60 years or older to prevent shingles. Does the chicken pox vaccine (Varivax) prevent shingles? Not directly, since children who get the chicken pox vaccine, even if they don't ever get chicken pox, can still get shingles. Their risk of developing shingles does seem to be much less than for children who aren't vaccinated with the chicken pox vaccine though.